The earliest reptile for which there is clear, undisputed fossil evidence is Hylonomus, from the Middle Carboniferous swamps of Nova Scotia; it dates from about 310 million years ago. Another early reptile, Paleothyris, dates from about 300 million years ago and also comes from Nova Scotia. Superb fossils of each have been found inside fossilized tree trunks. It is presumed that the animals perished inside the exposed tree trunks while feeding on insects, millipedes, and other arthropods that may have lived there. The reptiles may have drowned or been buried by sediment during a significant flood event. Their bodies, buried in mud and sand, were eventually fossilized as the mud and sand turned to stone. Hylonomus and Paleothyris represent the kind of small, lightly built tetrapods that one might expect from animals that were breaking the evolutionary link to water and hatching from eggs on dry land. The two animals show several key anatomical traits in transition from the forms of their amphibious ancestors. Of particular importance were the skull designs of Hylono-mus and Paleothyris, which diverged significantly from those of early amphibians. Amphibians such as Ichthyostega had large, flat, crocodile-shaped skulls with wide mouths. Such mouths were powered by a suite of strong but simple muscles at the rear of the skull. 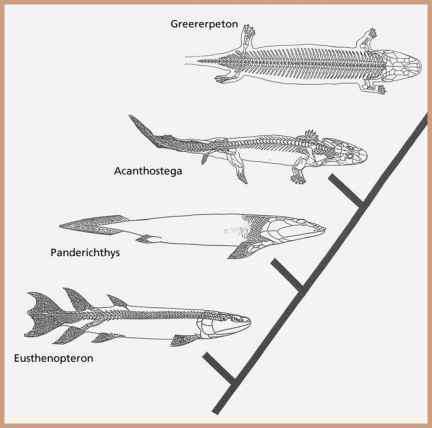 Ichthyostega and similar taxa were adept at snapping their mouths closed on prey, but they could not tighten the grip because their jaws were not designed to be squeezed tight. Their teeth functioned as little more than grappling hooks, snagging prey and trapping it in the huge mouth cavity. This design worked well for a diet that probably consisted largely of fish and other soft, waterborne creatures. But it did not enable the first amphibians to take much advantage of the vast, untapped terrestrial food sources represented by hard-bodied arthropods and plants. Hylonomus was one of the earliest reptiles to make a clean break from life in the water. teeth. Unlike the jaw muscles of Ichthyostega, the jaw muscles of Hylonomus and Paleothyris were larger in proportion to the size of their skulls and connected in two different arrays. In Hylonomus and Paleothyris, one set of muscles provided the snapping action for grabbing prey, and the other set of muscles provided strength for pressing the jaws together to maintain grip. The taller skull, smaller jaw, and larger muscles also provided more leverage so that these early reptiles could hold tightly to prey that could not initially be trapped inside the mouth. Plants represented a widely abundant new source of food for vertebrates. The earliest fossil evidence for plant-eating animals comes from petrified excrement from the Late Silurian Period. Although the identity of these animals cannot be known, their fossilized feces—known as coprolites—contain tiny bits of plant material and spores. 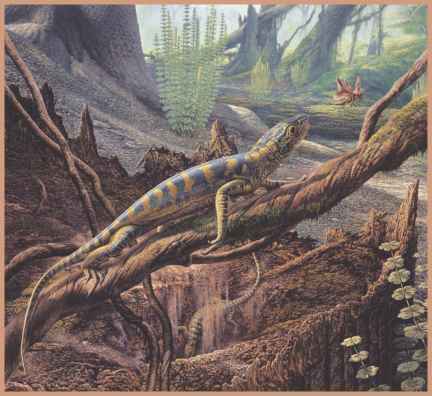 By the Permian Period, reptiles in significant numbers had adapted to eating vegetation. Their strong jaws and squeezing bite proved effective in gnawing and chewing the seedless vascular plants and gymnosperms that were plentiful in the coal forests of tropical zones. The development of large-scale herbivory began a new stage in the interrelationships of plants and animals and affected the evolutionary development of all organisms in the ecosystem. As plant eaters grew and diversified, so, too, did the predatory traits of the meat eaters who fed on them. Plants also adapted protective measures against herbivores; this resulted in a variety of tough outer skins, spines, and tougher leaves to serve as defensive measures. The skull design of early reptiles evolved ways to make the action of the jaws increasingly effective. By the Late Carboniferous Period, reptiles began to develop small openings in the skull behind the eye socket. This window in the skull provided additional space for the attachment of muscles while maintaining a strong but lightweight skull design that allowed these tetrapods to remain quick and agile even as they diversified into larger forms.